Natural Hat Trick Productions: Just One More Thing. . . I realize obviously a lot of stuff is being posted about the tragic death of young Alexei Cherepanov. I, admittedly, read little else at work today. 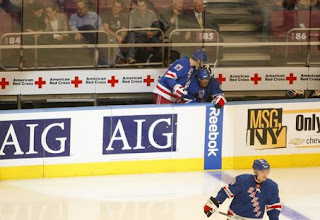 I'm including two things in this entry, all courtesy of Beyond the Blueshirts blog. They've done a great job over there of translating articles from Russian to English and getting more information than I could on my own. The first is the image above. Of 22-year-old Brandon Dubinsky comforting 23-year-old Nikolai Zherdev before the Moment of Silence last night at the Garden. Zherdev had known Alexei. Greetings to all fans of Avangard. My name is Alexei Cherepanov. As of today I am starting my own online blog. In it I will answer your questions and communicate with you. To begin with I want to say thanks to everyone who supports us. The arena is always full, and it helps us greatly to play. I hope that together we will achieve a lot this season. Currently we have three games on the road. It will be the first road trip under the leadership of [new head coach Wayne] Fleming. When he came to the team, he said “Now to us will be a new way. Give everything you’ve got, and together we’ll come out ahead.” With Fleming we spend less time practicing, but it is more intensive. We pay particular attention to our defensive game. And so our preparations for the away games went on as usual. Recently we were told to come to games in business suits. This was done at the initiative of the “Council of Four”, as they have been named in the press. In it are included Sasha Svitov, Dima Ryabikin, Jagr and Anton Kuryanov. They talked with the coach and delivered this decision. I know that some of the guys had to buy suits. I had no such problem — in my closet hangs two complete suits. They’re from my time at the draft. So I only had to buy a coat. This season there has been an important event — the arrival of Jagr. I generally consider him my fourth coach. He always gives me advice when something doesn’t work out. After practice we often remain with him and work on shooting. And he’s always ready to come to the aid of the other guys. Everyone sees that he very experienced in the game and wants to become a champion.The atmosphere in our team is outstanding. The guys encourage one another. I, by the way, have made a playful wager with [Viktor] Aleksandrov. We have bet a block of chocolates, that I will become the best player at the upcoming junior championships. He doubts it. We’ll see which one of us is eating the chocolate after the championships. So everything with us is good. I hope that my goal scoring streak will last. I will make every effort to make it happen! That’s all for now. We’ll see each other after the road trip! See you then!" Both make me tear up. But the second literally gives me chills. If there is nothing else gained from a life lost so young, let it be that in the future all arenas in the KHL have working defibrilators, and take safety precautions so that nothing like this happens ever again. A hard lesson to learn, but if anything can be taken from something so tragic, let it be that. Alexei, you will be missed.